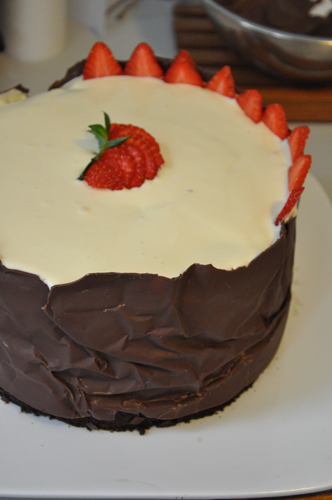 I made this cake for my sister’s 21st party she is a patisserie chef in training, so it was a daunting task to begin with, she gave me tips for doing the cake covering, naturally things still went wrong, but the rescue attempt from my ever so vaguely artistic brain came into action and it came out not half bad. 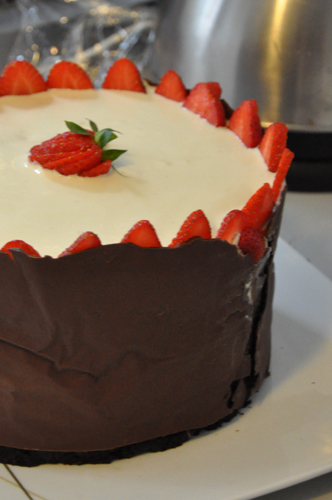 First time I’ve ever done something close to this (except make the tiramisu cake). 1. 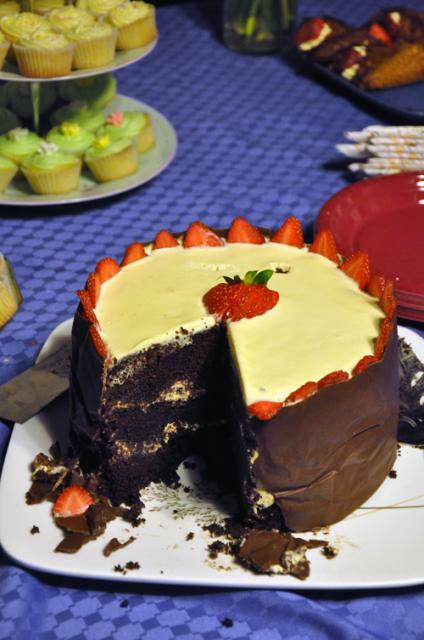 Make a tiramisu cake from this recipe. Carefully transfer to a nice plate, I sat the underneath of the pan outside of the edges (mostly because I couldn’t find the proper base) but it made it easier to get out. 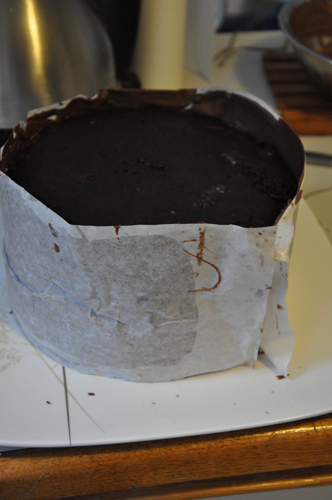 Cut your greaseproof paper to size (a little higher than the edge of the cake, use string to measure diameter etc). 2. Carefully remove the edge. Run a knife around the edge first, it should slide off quite eaisly. 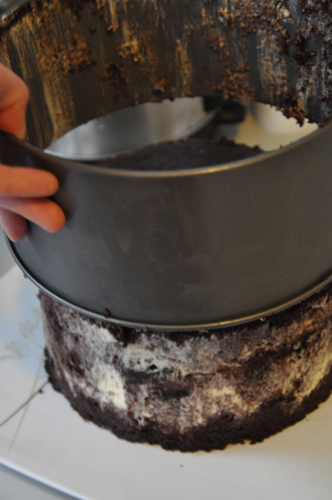 Squash any cake that goes astray back into it. 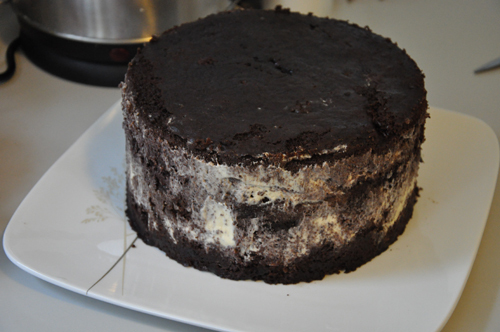 The cake is made of squashed cake so it’s quite alright to be a bit ‘mud-pie’. 4. 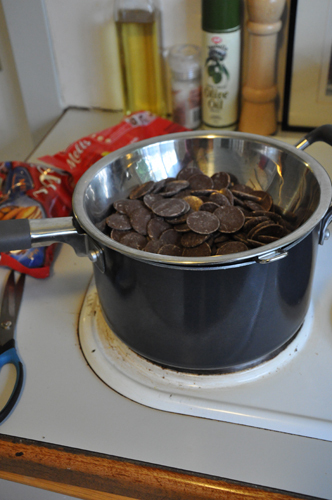 Find a metal or glass bowl and sit it over a saucepan of water, heat the water and stir the chocolate constantly. 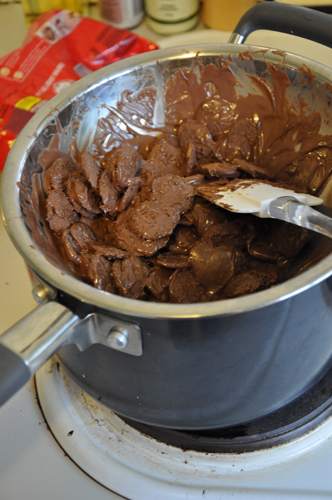 I used 1 pack of chocolate melts, there was plenty. 6. Looking good, keep stirring. 7. 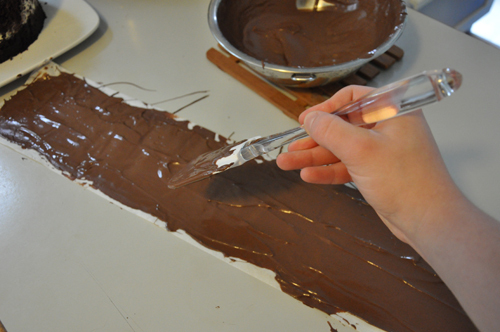 Spread the chocolate over the paper like a maniac, coat it, smooth it out and get the edge as straight as you can. 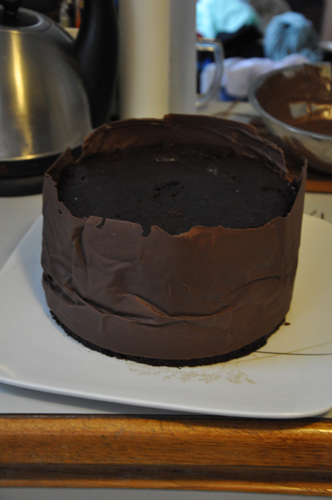 In hindsight I should’ve spread the chocolate all the way to the edge to get it straight… why I didn’t I don’t know!. 8. Leave the chocolate a little bit, I think this is where I went wrong (left it too late) apparently just as it’s losing it’s gloss. 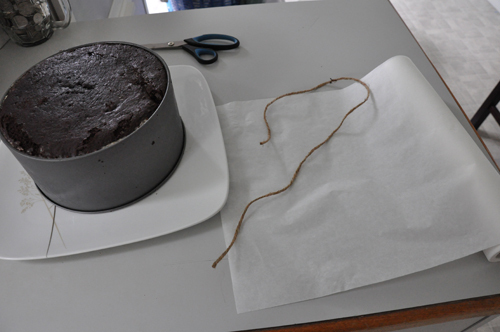 Wrap the cake KEEP IT SMOOTH (here’s also where I kind of screwed up). 9. You can peel off the paper fairly quickly. Do it carefully. Cry if you break it. 11. Genius! 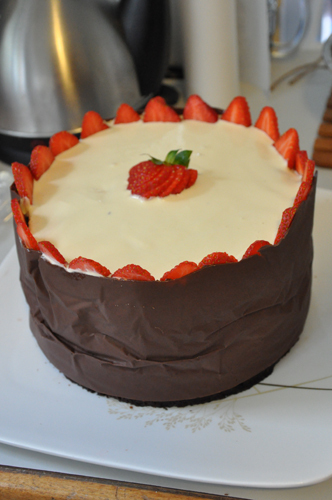 After making funky middle strawberry. 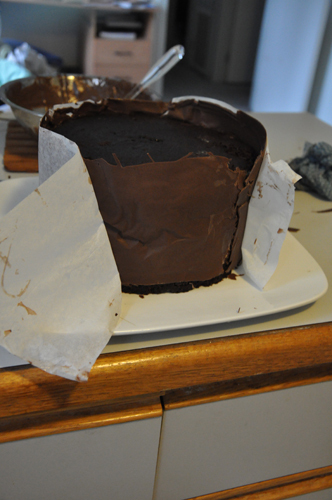 Brainwave hits to use cut pieces around the edge to hide the mess. 12. This was the mess of leaving the chocolate a little too late. Nothing can be done! So stop worrying and put that edge to the back when you serve it. 13. And it now doesn’t look half bad! One of my classes this semester is on Information and Interface design, we are primarily looking at information graphics and I’m loving it. 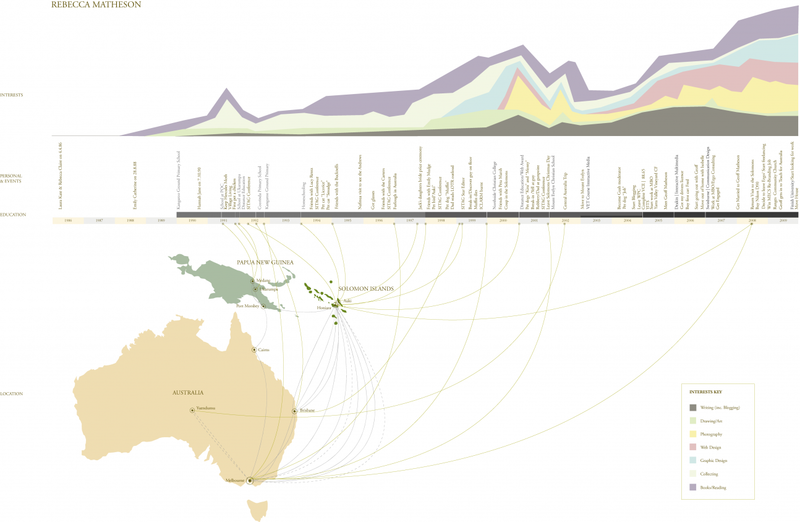 It’s quite a lovely partnership of rational facts, logic, finding relationships between data and visual output. The first project was to create an info-graphic based on our lives, to encompass family, education, interests and to somewhat represent past, present, future (or at least leaves conceptual room for the presentation of the future). This is mine. Now you can see what crazy things my parents did in dragging us to and from countries. Click for larger image. A little while back I talked about Wii Fit Routines, since then I have used the wii fit relatively frequently – not quite as often as I’d have hoped but we’re getting there and definitely more effectively. Although no massive weight change, my efforts have paid off in how well I can do particular things such as the 10+ minute jog getting my 57% burn rate to a 112% (I don’t think over 100% is mathematically correct, but that’s for the machine and I to argue about, nor do I know how they calculate these numbers – I think probably on how consistently and steadily you run). The whole routine thing, now that I’m back at uni, is starting to settle in. As you may have read over on Geoff’s blog there is now a ‘competition’ running with my in-laws to pull the body weight down before Christmas. Mostly as a bit of motivation. I don’t need to lose more than about 5kg so I probably can’t win, but the motivation of a competiton is a good one regardless of the prize (Which is good, but not the real draw card). Unfortunately I’m beginning to suspect that there is one little aspect of my diet that if I altered, could have a relatively decent impact without me doing a whole lot. I also discovered this past week that coffee has horrendously high embodied water which makes me quite sad (140L per cup!). Embodied water is all the water that goes into making something/a product. If you really want to save water, you can keep having those 3-4minute showers but you really need to work address embodied water as that’s where the biggest change can be made. Yes, your consumption of products affects water. And water is fast running out. We’re in the shits hitting the fan stage. It’s a much bigger problem than advertised. 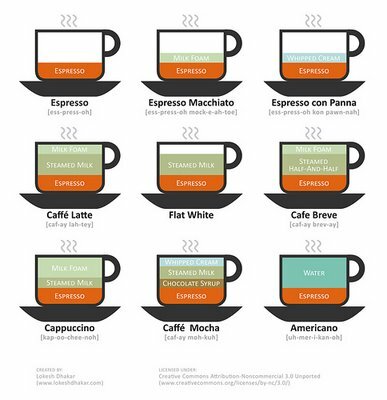 So will I cut the coffee? Perhaps not all of it, but I will limit the intake somewhat and opt for tea. Although I hate paying for tea when I’m out, I always get the idea that I’m just paying for a little bit of flavoured water… but I guess that’s better than 140L buckets arriving at my table. Last night saw the roll out of Cat and my brainchild. 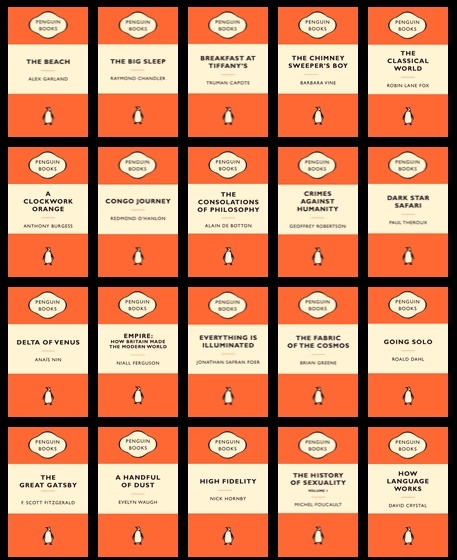 A bookclub that takes it’s material from the Popular Penguin books, mostly because they are cheap, readily available and on the whole with only a few exceptions entirely fantastic. There are twelve of us – largish group really, but despite not everyone knowing each other it seemed to work quite splendidly. We will be meeting once a month (subject to review). First book on the agenda is Cold Comfort Farm, which I can hopefully go purchase today. We meet again in a month. I’m either going to have to pace myself or write notes to aid my shocking memory, unless of course the book is slow and dull and then it might take me a month… although I somehow doubt it. I intend to experiment slightly to get something close to what I really like, the addition of the baked sour-cream layer sounds pretty darn good as well. Shall share success or failure when I get around to it and once I work out what farina is and what I can substitute (Semolina? ).